ESP Auto Inc, Services: Schedule Maintenance | ESP Auto Inc.
At E.S.P. Auto we use an online service called Identifix to design an extremely comprehensive and customer-friendly report for you. 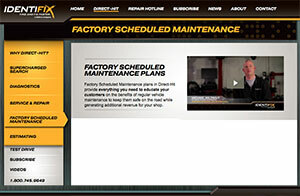 The Factory Scheduled Maintenance plan is a personalized report generated for each customer based on the year, make, model and mileage of your vehicle at the time of service. It is written in a way that simplifies the explanation of the maintenance required and why the customer should do it. All maintenance items are based on the Glovebox OE recommendations, meaning that you know your car is getting the exact maintenance it needs to run smoothly, efficiently, and safely at all times. Contact us today if you would like to schedule an appointment!